While rumors spreading out about the releasing of Windows 8, a Chinese website Win7China exposed some leaked screenshots of the future Windows 8 which portrays the improvement on the system tray area and the taskbar of Windows 8. Due to this streams of screenshots leaks, Microsoft has allegedly fired two of their own employees according to Windows8Center. 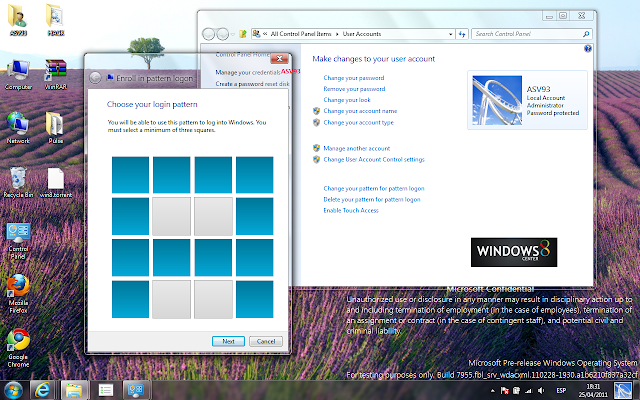 Well, since the leaked came out too early then,let’s know what we should expect with Windows 8 in rough. According to Win7China, Windows 8 will be a speedy install, taking a mere eight minutes, which the site says is 2.5 times faster than Windows 7. Keep in mind, though, according to Windows 8 News, Microsoft is using a fast PC with an eight-core CPU to get those numbers.The leakers say that Microsoft has expanded its System Restore capability. Now it’s referred to as “Factory Restore,” a hard-reset function that rolls back Windows 8 to its original state in two minutes. Additional information have been posted on Winreview, a Russian news site. Windows 8 will include a hard reset option to reset the operating system to factory settings in two minutes. This feature alone is pretty interesting for users who want to start anew. A possible scenario is to reset Windows 8 every time it has been used to always start with default settings. The installation time of Windows 8 has been reduced by a factor of 2.5 from 25 minutes to 8 minutes. Microsoft is using a fast system (24 Gigabytes RAM, 8-core cpu, 2 TB hard drive to measure the time). These are just some few of expected Windows 8 cool things and I hope that with all the excellent features and improvements,Microsoft woud also consider how the package could fit in a small disc for installation convenience. Experts say, this would take 2 to 3 years after Windows 7 was released but Microsoft executives didn't nail down yet their future plans about Windows 8 and any innovations as well.